In our nine years of homeschooling and working from home, we have used many different types of time management systems to make sure we stay on track and get stuff done. 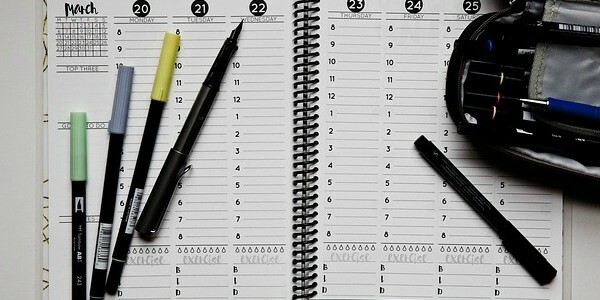 We have used separate planners for everyone. We have used a single planner for everyone. We have scheduled our time down to what time each subject or task was to start and end. And, at one point, we threw away the planner and just made lists of tasks that needed to be completed by day’s end. I’m not sure how many planners (paper and online) or systems we have used. I’d say a lot. Each planner and system was right for the time and place we were in life. However, one system stood out and we still use it today. A Block schedule is simply working within chucks of dedicated time. I think of it as organizing time and tasks together. Each hour of the day is a basket where tasks are placed. Each basket can only hold so much, and each basket can only be used during the block of time to which it is assigned. The idea is to put the right task in the right basket and to not overflow the basket. This usually needs some time to work out. (Check out: How To Create A Homeschool Schedule That Works) Another important part of a block schedule is that you can’t work on a task from another basket until everything is completed that was designated for that hour. And when that block of time is up, it’s time to move to the next block of time and work on the tasks put in that basket. For instance, we might have the 8am to 9am time block dedicated to checking emails (Mom) and morning tasks (kids). The 9am to 11am time block might then be dedicated to homeschooling only. If we get the emails and morning tasks completed by 9, we move on to what is in the next basket – homeschooling. However, if we are still homeschooling within the 9 to 11 time block, I’m not going to check emails. Emails are not in my 9 to 11 basket. That would cause me to be distracted from homeschooling the kids. This wastes time and hurts the quality of the homeschool experience for us all. It takes some discipline to stay with the tasks at hand in the block schedule, but once you get it down, it’s so worth it. I do not use a block schedule planner. I just have the time blocks written in a notebook and I made a copy for my kids to refer to. The kids do have planners to keep track of their school work. (Check out this Daily Lesson Planner Printable) My daughter is in high school and likes the online planner Homeschool Manager and my middle school son likes a simple planner I buy from Walmart at the beginning of the school year or the planners from A Plan In Place. If you like something a bit more planner-ish than times written in a notebook or like visuals, try this simple block schedule printable. 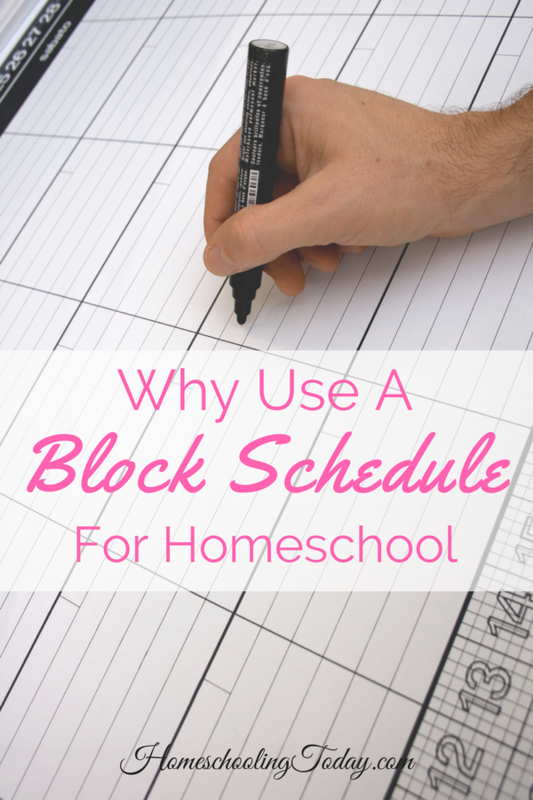 Block scheduling has worked great for our homeschool life, as well as for my professional and personal time management. It carries the same benefits for each part of my life. These are some of the main ways block scheduling has helped us. Block scheduling has been great for keeping us on track. Instead of trying to do three different things at one time and taking three times as long, block scheduling allows us to work on one task at a time. It usually gets done better and faster that way. It truly organizes our time. This is so helpful in a homeschooling family, especially when a mom works from home like I do. In our situation, I found myself checking my emails all day long and getting distracted from teaching the kids or household chores. It was like putting out small fires all day, but never really getting anything done. A block schedule is still a daily schedule, but without a lot of the rigidity of a detailed schedule. For instance, we don’t go as far as to say math is from 9:00 to 9:20 and grammar is from 9:20 to 9:40. We have freedom within the block of time to work on whatever school work needs to get done. We can, also, move blocks of time around. This is necessary when you schedule field trips, outside classes, or family game day (it’s a thing at our house). 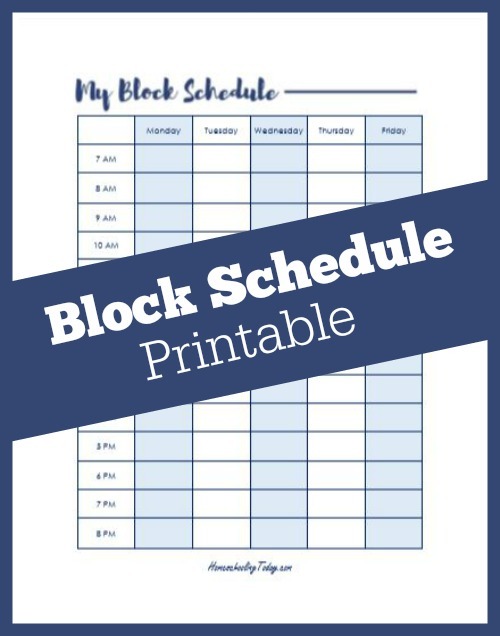 Look at your block schedule and see where you can fit that in and what needs to be replaced or just moved. Before block scheduling, we would have to pause our school work and head out to a dentist appointment or a haircut. It would be hard to get back to school work when we returned. That cuts our productivity. With the block schedule, I have a day and time block set aside for errands and appointments. By working on just what is designated for that time block (what task was put in that basket), we can fully concentrate on that task without fear of being interrupted. Our schedule actually varies from day to day according to after school plans, days set aside for errands and appointments, and the time of year. This is what our Tuesday block schedule might look like for us. What type of homeschool time management system do you use? 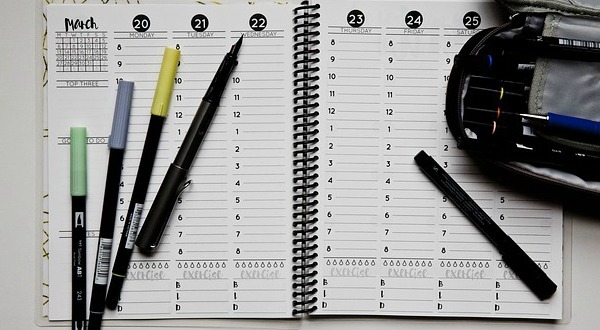 Are you a rigid planner? Do you get by without a real plan? Have you ever used a block system? We do block scheduling and it works great for us. 7:30 – 9:00 is our breakfast / morning chores time. 9:00-11:00 is devoted to math. In spite of a two-hour block daily for this one subject, my daughter isn’t “way ahead”. In fact math is her weakest subject, so we utilize the extra time to go slow, give plenty of instruction, have mini-breaks, repetition, & practice of that day’s lesson because once she “gets it”, she’s good to go, it just takes a bit for her to get it. 11:00 – 12:30 alternates between social studies, science, and language arts. These are her faster subjects where she can cover a week or more of material in one hour. 1:30 – 3:00 alternates between independent school work and specials she attends at the local public school (two days a week she goes for computers & music, a practice we may or may not continue beyond this year). 3:00 – ??? Alternates PE (dance classes & basketball practice), life skills (ie chores), journaling, bible study, . This time is open as its “regular” on the whole but daily times have a bit of irregularity (basketball practice Mon 5:15-6:30 & Wed 6:30 – 8:00, dance Tues 3:30 – 6:00). This is also the time frame appointments and errands are taken care of when possible. We don’t run on a strict schedule, and there’s days we completely abandon the schedule, but it’s what we aim for.